70% of the Ugandan population lives in rural areas with 19.7% living below the poverty line and majority of these are women. In a country of approximately 38 million people, only 500,000 people are connected to the electricity grid and rely mainly on kerosene for lighting and biomass for cooking increasing health related risks (respiratory illnesses) from exposure to indoor pollutants, greenhouse gas emissions and high fuel costs. “I have a family of 12,” says Hon. Raleo Rose, a Youth Councilor in Adjumani District which lies 460 kilometers from Kampala. “I used to buy 1 bag of charcoal every two weeks to cook for my family, but from the time I bought an improved cook stove, I now buy only one bag of charcoal in a month,” she says. “1 bag of charcoal costs UGX 25,000 in Adjumani. I used to spend UGX 50,000 per month on two bags of charcoal to cook for my family. Today, I use only 1 bag of charcoal per month. I save UGX 25,000 every month,” she adds. The improved cook stove is expected to last at least 5 years. In this period, Rose will save UGX 1,400,000 which she will invest in income generating activities for her home. A study conducted in Uganda’s West Nile District of Arua indicated that 72% of households use traditional three stone open fire cooking technology. This encourages high levels of deforestation from harvesting firewood for cooking. Reports by National Forestry Authority (NFA) indicate that the highest levels of forest cover loss in Uganda are experienced in the Albertine Graben. These are areas along the Rift Valley basin of which West Nile Districts lie. Between 1990 and 2005, Uganda lost 26.3% of its forest cover, or around 1,297,000 hectares. World Wide Fund for Nature-Uganda Country Office (WWF-UCO) is rolling out an innovative business approach using Community-Based Organisations (CBOs) to improve the distribution chain of solar kits and improved cooking stoves to 17,000 households and 12,000 respectively in the Albertine Graben. The “Scaling-Up Rural Electrification Using Innovative Solar Photo Voltaic Distribution Models” Project is being implemented in 20 Districts of the Albertine Graben in Uganda. The project builds on the work of the Champion District Initiative, a district led approach towards increasing access to clean and renewable energy for off grid communities. The overall objective of the project is that by 2025, rural livelihoods are improved and greenhouse gas emissions are reduced through widespread access to clean and renewable sources of energy in Uganda. The project targets to sell 17,000 systems Home Solar PV Systems to households for lighting and businesses hence contributing to the national target of a 25% increase in Renewable Energy by 2025. 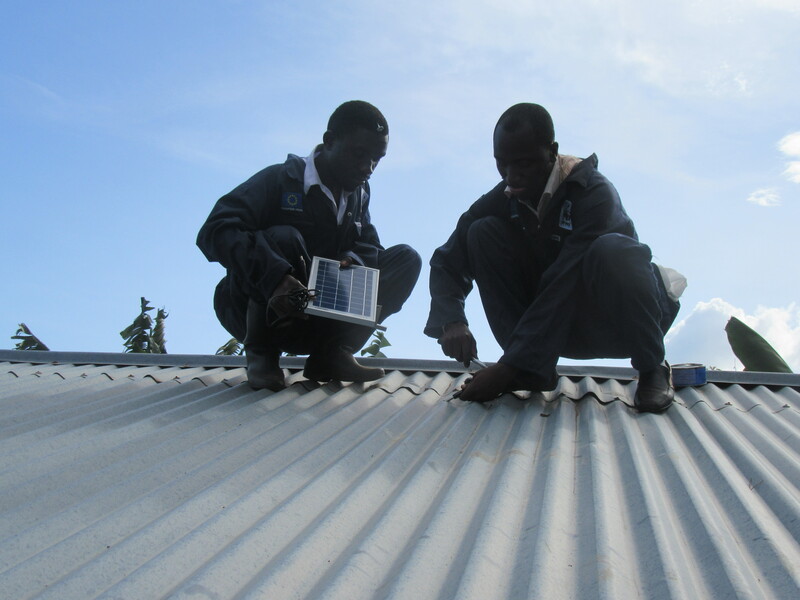 “We are stimulating demand for solar PV technologies in the community by raising awareness. We distribute the solar kits and improved cook stoves to people living in areas that are hard to reach and neglected by the private sector,” says Dr. Isaiah Owiunji, Energy, Climate and Extractives Programme Coordinator, WWF-UCO. The project will also install larger solar PV systems (1000W) in social institutions such as health centers and schools in the selected districts of Albertine Graben contributing to improving the key services provided by these institutions, thus reducing child mortality and maternal health problems and contributing to sustainable development goal (SDG) 3 and 5. To date, about 250 households have installed solar systems for household lighting and phone charging reaching 2000 people indirectly and 1000 households have purchased improved cooks stoves reaching 7,000 people indirectly. While the uptake is still low, demand is expected to rise. “I see a lot of interest from people whenever we go to the communities to talk about the products,” says Edith Muhindo, a coordinator at KIIMA Foods, one of the local NGOs supported by WWF located in Kasese district. “People show they are ready to embrace the technologies. But, when you mention the price, they hold back,” she adds. “The challenge we see is that the cost is too high,” says Dr. Isaiah Owiunji. “As civil society, we have a role to play in the renewable energy sector such as ensuring that the costs of renewable technologies come down for the end consumer,” he adds. There are several processes that WWF together with other partners are engaging government on. These include lobbying government to exempt solar batteries from tax, participation in legislative process through production of policy papers to advocate government to invest more money into renewable energy. Others include ensuring government puts in place standards for improved cook stoves to improve quality. “There are a lot of substandard solar products on the market. It is hard for the ordinary person in the village to differentiate a genuine product from a counterfeit,” says Edith. Technicians installing a Solar Home System for rural communities in Western Uganda.